Action: Kneel Renly's Pavilion to choose 2 characters. Until the end of the phase, one of those characters gets -1 STR, and the other gets +1 STR. 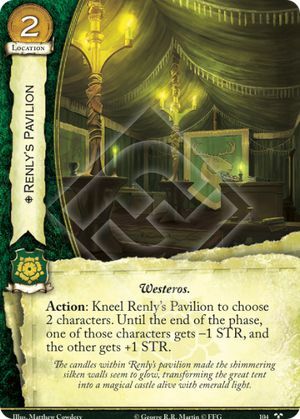 The candles within Renly's pavilion made the shimmering silken walls seem to glow, transforming the great tent into a magical castle alive with emerald light. This card brings: Areo Hotah, Balon Greyjoy (Core), Brienne of Tarth, Bronn, Catelyn Stark (Wolves), Daenerys Targaryen, Dagmer Cleftjaw, Eddard Stark (Core), High Septon, Jaqen Hgar, Khal Drogo, Mance Rayder, Mirri Maz Duur, Qhorin Halfhand, Randyll Tarly, Ranging Party, Robb Stark (Core), Robb Stark (Wolves), Robert Baratheon, Ser Jaime Lannister (Core), Stannis Baratheon (Core), The Knight of Flowers, The Queen of Thorns, Tyrion Lannister (Lions), Tywin Lannister (Lions), Victarion Greyjoy, Wildling Horde. Into HFK range. I am so happy!